cost Please contact us for details. 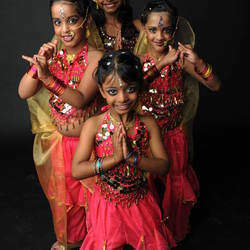 We offer lessons in Bharatha Natyam & Bollywood Dance styles. Enjoy dancing to the latest North & South Indian movie songs or learn the intricate style of Bharatha Natyam (South Indian Classical dance. Fun, energetic & relaxed atmosphere with experienced & patient teachers. We offer various age appropriate classes. No previous experience required! Performances can be arranged for corporate functions, party entertainment & wedddings.